Do you know why leaves change colors in the fall? The answer has to do with chemical compounds in leaves known as pigments. You may have heard of the green pigment chlorophyll. At the Nokomis Market on July 27, visitors explored how other pigments are present in leaves all the time but are invisible until autumn. Seasonal changes, including shorter daylight hours, cause plants to break down chlorophyll which is quite “expensive” in the amount of energy needed to produce it. Visitors explored the importance of chlorophyll in photosynthesis by recreating the photosynthetic cycle on a felt board. When photosynthesis slows in the fall and a plant breaks down chlorophyll into its components, it will recycle these component nutrients. Other pigments that were once hidden become visible because of the breakdown of chlorophyll. The pigments xanthophyll (yellows and browns), carotenoids (orange), and anthocyanins (reds and purples) are the vibrant colors we see showing through in autumn. To explore the idea hidden pigments, market goers performed chromatography, the process of separating a substance into its components. Visitors separated colors by marking a dot on a piece of chromatography paper, dipping it in water, and observing the water soak up the paper through capillary action. The results showed that secondary colors like green separated into primary colors like blue and yellow. You can perform your own chromatography with markers at home using coffee filters. Separating leaf pigments takes up to an hour, so market goers prepared their own take-home leaf chromatography kits. Market Scientists provided leaf samples from a common houseplant called Zebrina with bright purple and green leaves. Visitors tore the leaves into small sections, put them in a plastic vial, and covered the leaf bits with a small amount of isopropyl alcohol. Equipped with their own leaf samples, chromatography paper, and instructions, market goers left with science kits to explore leaf pigments. Curious about the results? Take a look at the chromatography paper below. Can you pick out the two primary pigments anthocyanin and chlorophyll? Visitors separated colors with a prism, but instead of pigments, they saw different wavelengths in the visible light spectrum. Our youngest visitors also enjoyed observing leaf trichomes, or hairs, under a microscope. Thank you to Nokomis Market for welcoming the Market Scientists and for all the visitors who explored leaf colors with us! Have you ever seen a Minnesota prairie? If you have, you’re lucky! It is such a unique and fascinating ecosystem, but is disappearing at an alarming rate. Minnesota had over 18 million acres of prairie in the late 1800’s, and now only 1% of that remains. The Healthy Prairies Project is a UMN research initiative funded by MN LCCMR to help conserve and restore our native prairies. 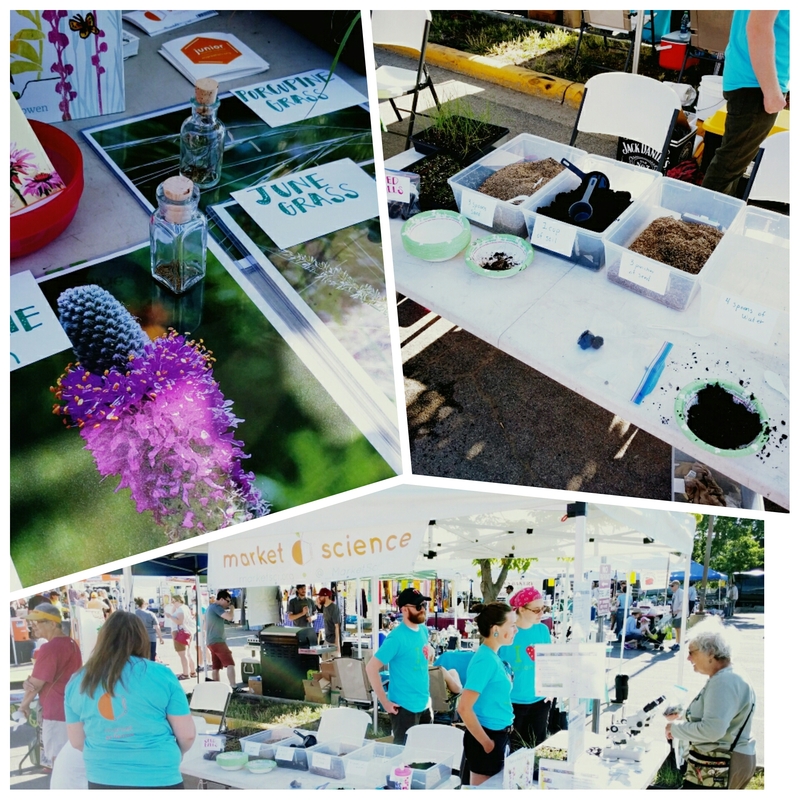 On Saturday, visitors at the Midtown Farmers Market got to meet the Healthy Prairies team and learn about this precious MN ecosystem! 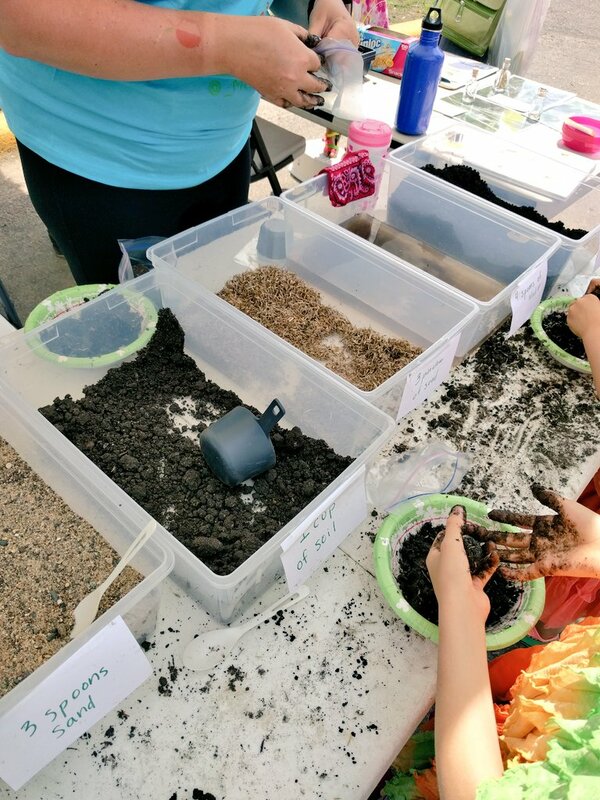 They even got to make their own “seed balls” filled with native perennial grass seeds, which they can take home to grow their own prairie plants. Perennial prairie grasses like Big Bluestem (Andropogon gerardii) and Sideoats Grama (Bouteloua curtipendula) have very deep roots that help reduce soil erosion, filter water, and store lots of carbon. Plus, they’re extremely drought tolerant! You can compare the roots of regular turfgrass (far left) and native plants to see that natives have a lot more going on underground! There are also a whole host of prairie wildflowers that serve as important food sources for lots of pollinators like bees and moths. 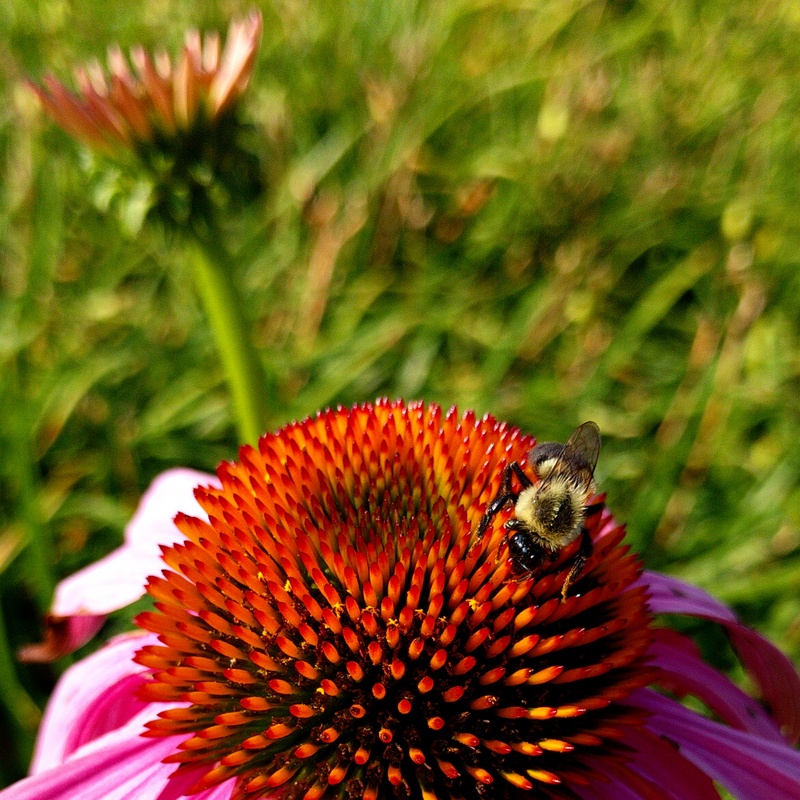 You can learn more about planting a prairie garden here. But did you know there’s even cool stuff going on inside the leaves of these plants? Every leaf of every plant you see has fungi and bacteria living inside; we call these microbial dwellers leaf endophytes. At the Healthy Prairies Market Science session visitors got to see the huge diversity of fungi that live inside the leaves of some prairie plants. If plants are filled with fungi and bacteria, just what are those microorganisms doing in there? In fact, different endophytes do different things, and there are MANY different fungi and bacteria that live as endophytes. So the short answer is: Lots of things! What’s the long answer? Some endophytes can protect their plant hosts from being eaten, or help them survive in hot or dry places. Others might actually be pathogens, but are living as endophytes because some condition isn’t right for them to cause disease. 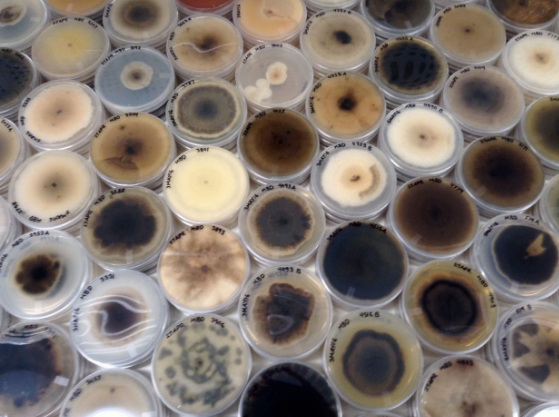 For many endophytes, we still don’t have an answer. Maybe they help the plant, or maybe they hurt the plant, or maybe they don’t affect the plant at all. We don’t know yet! Plant endophytes are a rapidly developing field in biology, and the Healthy Prairies team is on the forefront of research investigating the roles these microbes play in the prairie. We hope you enjoyed visiting the Healthy Prairies team at Midtown, and that you’ve thrown your seed balls far and wide! 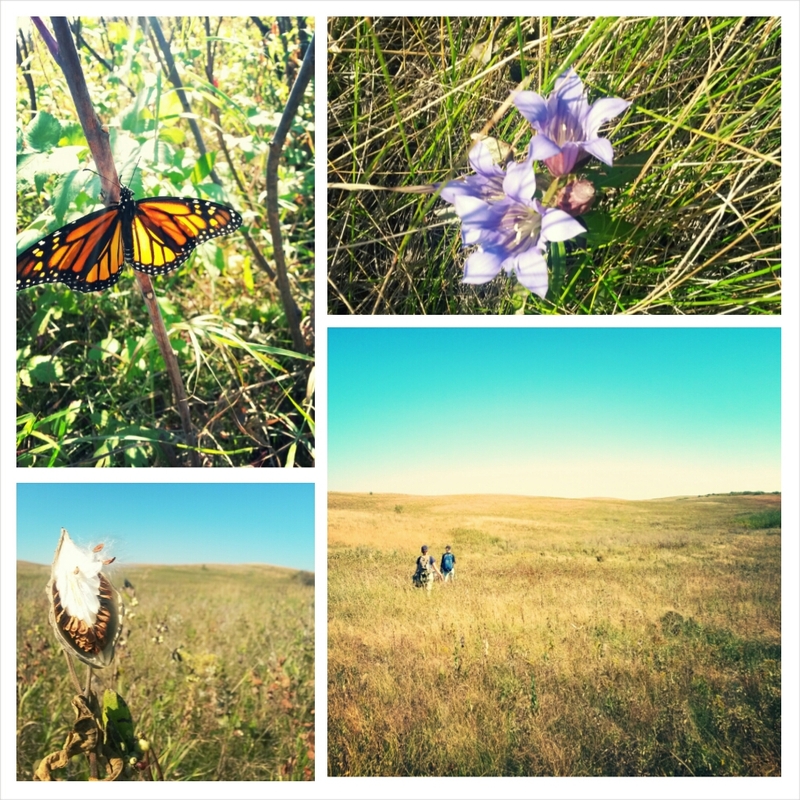 There are lots of prairies you can visit across the state; here are a few to get you started.